Energy and environment stories are all about context. Each locale has its own mix of energy options and environmental sensitivities. Getting on-site makes all the difference. For “Lighting Up the Andes” Spectrum sent me to Bolivia’s Cordillera Réal in 2004 to track a Canadian couple pioneering the use of solar-powered LEDs to illuminate remote off-grid villages. Their innovative blend of development and ecotourism financed the equipment, and sowed plenty of conflict. State Grid Corporation of China — the world’s 2nd largest company — is building an ultrahigh-voltage power transmission network whose scale and scope remain unimaginable for grid operators everywhere else. My on-the-ground reporting in 2018 provided IEEE Spectrum readers with a rare inside look at China’s grid technology and the contested politics of using it. It was my third reportage from China. In 2005 I revealed the two-wheeled electric transportation revolution challenging China’s official infatuation with the automobile. That article, “China’s Cyclists Take Charge”, helped Spectrum’s special issue on China win a National Business Journalism Award. Two years later I was covering China’s growing use of coal gasification for Technology Review, tracking the huge coal-to-diesel operation in Inner Mongolia that Western experts bet would never be built. “China’s Coal Future” showed that water consumption — several barrels worth per barrel of fuel or chemicals — would ultimately limit gasification’s proliferation in the coal-rich but arid north. A Scud missile plant outside of Tripoli transformed into a 300 kilovolt substation provided the Kafkaesque backdrop for “Closing the Circuit” — a 2008 feature for Spectrum on the bid to link Europe and North Africa’s power grids. I found Libyans eager to escape from years of isolation, and paving over the past as they pushed forward. In 2004 workers at the Toyota assembly plant at Tsutsumi were already turning out 400 Prius sedans a day — an early dividend from Toyota’s bet on hybrid technology. 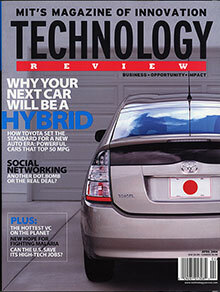 “Hybrids’ Rising Sun” in Technology Review showed the degree to which Toyota had already mastered the next big leap in automotive technology, and why Detroit and Stuttgart are still playing catch-up. Japan proved far less capable of sustaining an early lead in solar power. In 2014 I was back in Japan for Technology Review, profiling how Japan built and lost its dominance in photovoltaics and may now be doing it all over again. Turning solar heat into power lost its edge amid the recent glut of cut-rate Chinese solar panels, but in “Profile: Hittite Solar Energy” I revealed why a Turkish start-up’s plan could put solar thermal energy back in the game. By selling steam instead of power in markets where gas-fired steam is pricey the Istanbul-based firm is going where photovoltaics can’t. Paris-based nuclear equipment and services giant Areva’s technology for reprocessing spent reactor fuel looked enticing when the Bush Administration set to relaunching the U.S. nuclear sector. By recovering plutonium and uranium and vitrifying the remainder, the French system promised to reduce the need for unpopular nuclear waste repositories such as the now-cancelled facility at Yucca Mountain. In ”Nuclear Wasteland”, published by Spectrum in 2007, I followed the radioactivity trail in France’s reprocessing system and found some hidden holes. Climate change concerns span Germany’s political spectrum, and that consensus has propelled its shift from fossil and nuclear energy to renewables for over 20 years. Get up close, however, and one sees the competing commercial and environmental interests that have buffeted the program. In 2009 they had nearly pushed it off the rails, as I showed in a feature analysis for Spectrum entitled “Germany’s Green Energy Gap.” In 2013 I show in “Germany Jumpstarts the Supergrid” that what Germans call the energiewende got its mojo back. The most dramatic sign: a bold plan to upgrade Germany’s balkanized power grid to handle shifting flows of wind and solar power by installing high voltage direct-current or DC lines at the heart of an otherwise AC grid. It is the most radical shift in grid design since DC-advocate Thomas Edison conceded defeat to Westinghouse and Tesla over a century ago — and one that some top US-based power experts refused to believe. Melting the billions of barrels of hard tarry petroleum trapped in Alberta’s oil/tar sands comes with a heavy environmental price tag. In 2003, when I wrote my exposé on its out-sized climate footprint — “Digging a Carbon Hole for Canada” [pdf] — investment was booming and many Canadians still refused to see their homegrown cash-machine impugned — including the editor-in-chief at the influential magazine that commissioned my story. So feisty Calgary-based AlbertaViews got it. My angle — that financial levers such as carbon trading and taxes would not squelch Alberta’s infamously high-carbon crude — proved all too prescient.